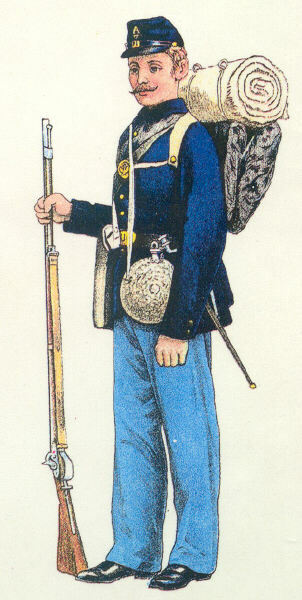 This would be typical appearance of a Civil War soldier in the field. His coat is a four button losely fitting sack coat, which was one of two types of uniform coats issued to enlisted men. The sack coat lacked the branch color trim that are found on the more formal frock coat or mounted man's jacket and was much less costly for the government to produce. Photographs of troops in the field show that it was popular and commonly worn both by foot and mounted soldiers. The regulations mention that it was intended for "fatique purposes." Unlike the frock coat or jacket musicians did not have any special lace facings on the front of their sack coats. His forage cap has a sloping visor, commonly referred to as the McDowell style. Other forage caps were manufactured with a flat visor. There is a company letter above the regimental number on the front. Regulations mention the company letter only. In practice various combinations of insignia were worn by various soldiers. He wears a knapsack with blanket roll, canteen, bayonet and a haversack.